This method is very old, but is useful in shallow rock sequences, especially clastics. You may need to determine new parameters for each major geologic horizon. NOTE: Constants given are for depths in FEET. If depths are in meters, convert depth to feet. by multiplying depth in meters by 3.281. To obtain DTCsyn in usec/m from DTC in usec/ft, divide by 3.281. The Faust transform can be used when the sonic log is missing, and can be calibrated with offset well data, check shots, or vertical seismic profiles. The method does not account for gas effect. The method does not account for gas effect. You may need to determine new parameters for each major geologic horizon. This method assumes a fairly sophisticated log analysis can be run on the well in question or on a nearby well. This is needed to obtain a list of water resistivity (RWA) versus depth. 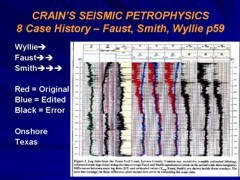 Since most sonic log problems are in shales due to bad hole or rock alteration, this calculation is usually possible and should be done continuously or at least zone by zone. When the zone is 100% shale, this equation should return a reasonable travel time. If it doesn't match the log where it is believed to be good, then adjust RWSH or Vsh. In clean zones, adjust DELTMA or RWA if needed. When zones are hydrocarbon bearing, RWA and RESD will both be too high, and the result will be close to correct, but may give a DELTmod that is too low (too high a velocity) or a DENSmod that is too high. Neither method accounts for the effect of gas, which must be handled separately.